Learn how to easily set discount/promo codes and coupons on WeTravel to give certain users a special price. On your "Edit Trip" page go to the fourth tab "Pricing". On the lower half, choose "YES" for the question "Are you offering discount codes?". Click on "Add Discount Code" and enter the details in the popup. Choose a code and choose if your discount is a percentage of the price or a fixed amount. 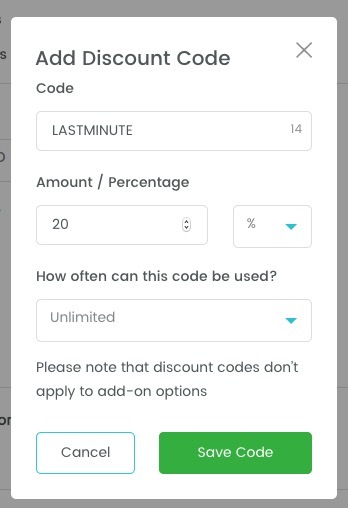 Next, choose the availability (the limit on how many times the discount code can be used in total) and click "Save Code". Discount codes will be applied to every participant within the booking, e.g. if you have set up a code of $100 and it's a 3-person-booking the total discount will be $300. When editing your WeTravel trip, you need to hit "publish" to make any changes go live. This is also true for discount codes. After adding your code, press "Publish" and the code will be available to your customers. 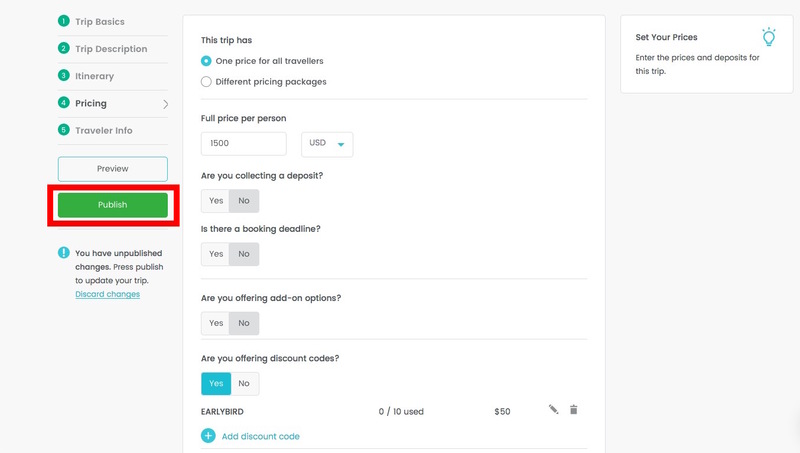 When a customer books a trip that has discount codes, there will be an additional field on the checkout page labeled "Discount Code". Please note that the discount will only be applied towards the balance due of the trip, the deposit amount will not be discounted. If you have a payment plan set up then the discount code will reduce the installments equally. 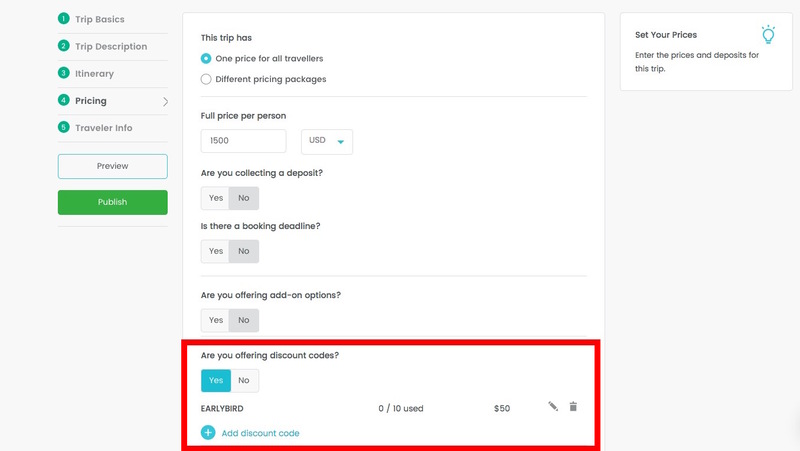 Discount codes can be a great way to get participants to book early, but they should be used with caution: studies have shown that a "Discount Code" field in the checkout process can lead to lower conversions (i.e. fewer sales). This happens because users that intend to buy often leave the booking page and start googling in the hopes to find a discount code. Then, if they don't find one, become frustrated and don't return to checkout. If you have discount codes like EARLY BIRD or similar that are available to all customers at some point in your sales process, make sure that they are prominently mentioned in the description of your trip, maybe right at the top. This way, no customer feels left out or starts searching the Internet for discount codes. On the contrary, they feel like they got a special deal and are likely to book right away because they are afraid that the deal might not last. WeTravel discount codes do not have an automatic end date. When your promotion is over, simply go back to "Edit Trip" → "Pricing" and delete the discount code (remember to hit "Publish" after). This will not affect discounts extended to those who booked before the code was deleted. A discount code can only be applied when making the initial booking. Discount codes cannot be applied when paying for an installment or add-on at a later point. If a discount needs to be applied after the initial booking has been made then please use the Custom Price function to lower the trip price.